"London's hottest ticket" (Guardian), "One of the hardest reservations to land in the city" (New York Times), "London's hottest spot" (Wall Street Journal) and to top it off a Michelin star in October 2012, only months after the the January 2012 opening. 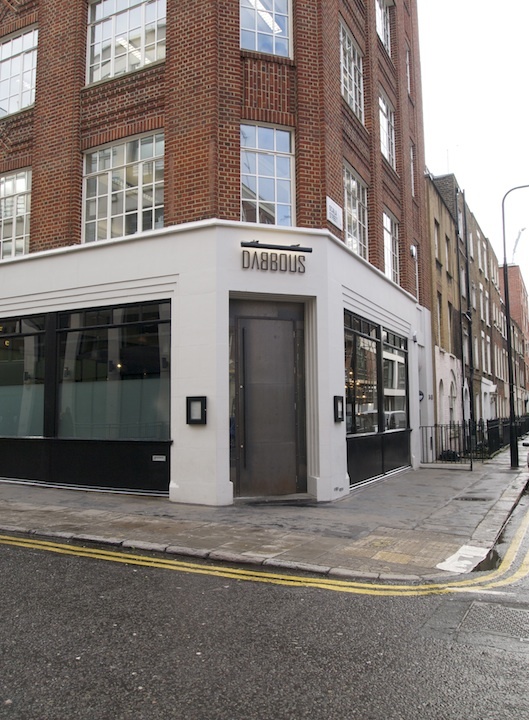 Yes, Dabbous started off to much critical acclaim, in fact it was the most talked about restaurant opening in London in 2012. You can imagine why it took me a while to get in. Dabbous is a two-story, modern restaurant and bar with a minimalist design in London's Fitzrovia and it's chef Ollie Dabbous' first solo-venture. Ollie trained in some of the best kitchens in Europe, such as Raymond Blanc's two-star Le Manoir aux Quat'Saisons in Oxford, Andoni Luis Aduriz' two-star Mugaritz in Spain, Claude Bosi's two-star Hisbiscus in (then) Ludlow. 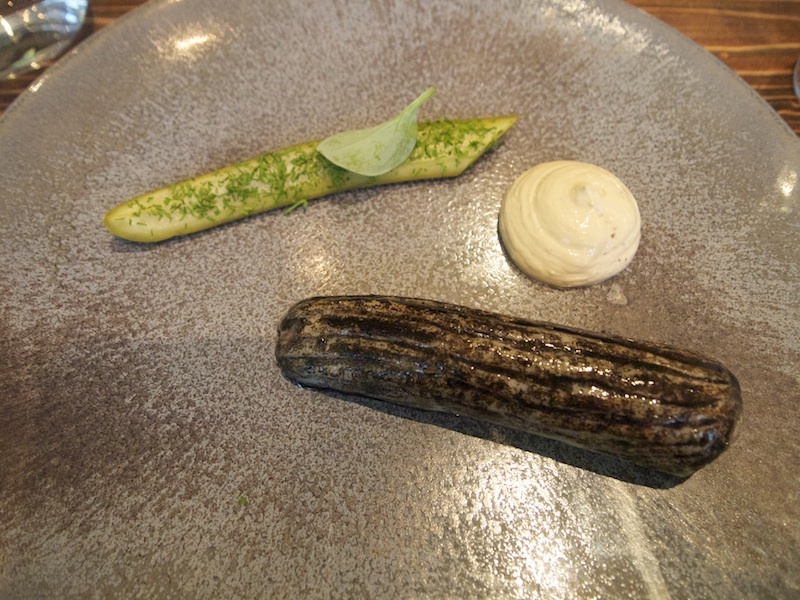 He also did brief stages at Noma in Copenhagen, Pascal Barbot's l'Astrance in Paris and The Fat Duck in Bray. Before opening his own restaurant, Ollie Dabbous was head-chef at the Michelin-starred restaurant Texture in London. The restaurant is located on the ground floor and in the basement there's Oskar's Bar, overseen by mixologist Oskar Kinberg. The cocktail menu features a good selection of creative (seasonal) cocktails and a choice of bar snacks. 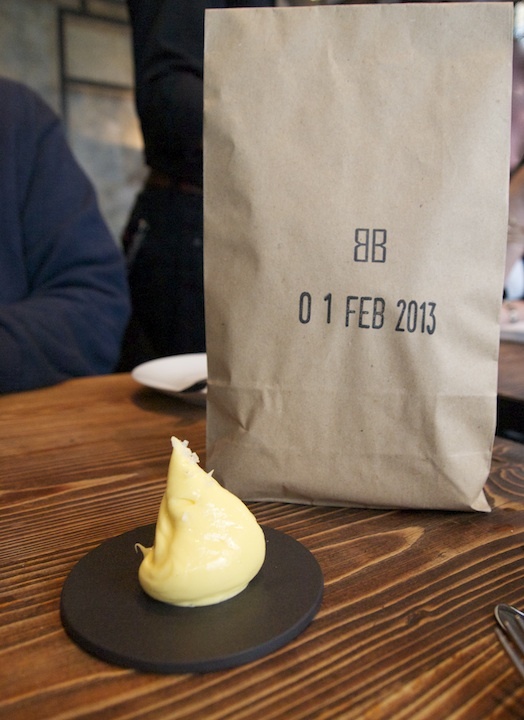 Dabbous is open for lunch and dinner Tuesday till Saturday. The restaurant offers a 7-course tasting menu (£59 + £9 for an optional extra cheese course), an a la carte menu and for lunch there's a 4-course set lunch menu (£28). I had lunch with my husband at Dabbous on Friday 1 February 2013 and I ordered dishes from both the a la carte menu and the set lunch menu. When we arrived, we first had a cocktail in Oskar's Bar. 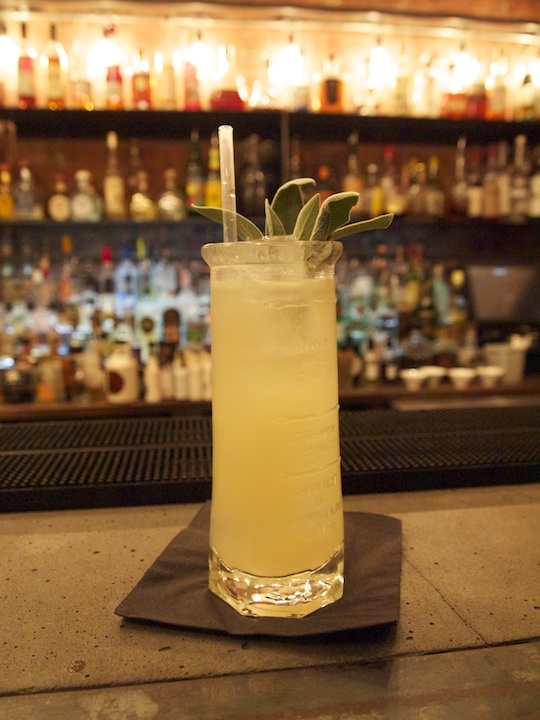 I had a Fizzy Rascal (Vestal Vodka, elderflower, apple, lemon juice, sage, cucumber, Italian Champagne) and hubby had a classic Rob Roy (Talisker 18, Antica Formula, angostura bitters). 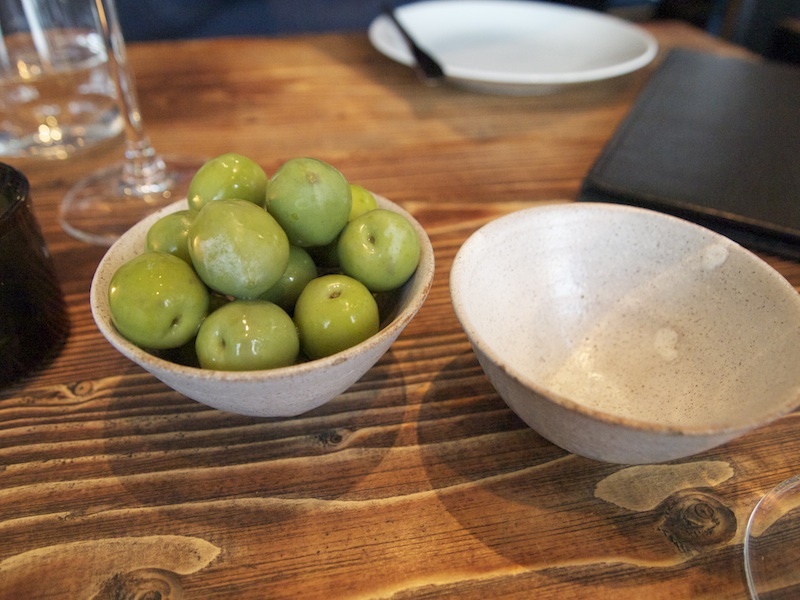 At the table some juicy green olives arrived, followed by freshly baked crusty bread served in a brown paper bag. The first course was Speckled endive with gingerbread, bergamot & mint. 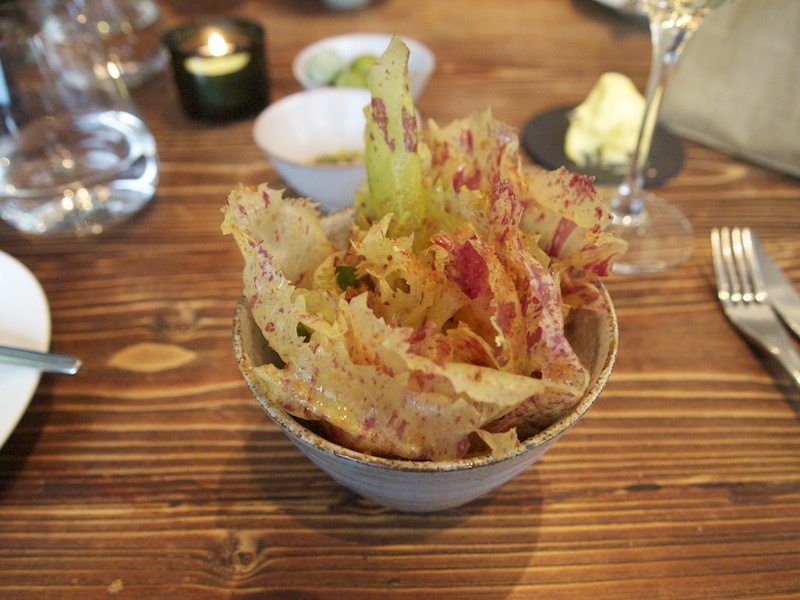 Lovely fresh speckled endive (radicchio) leaves, each leaf individually dressed with a gingerbread and bergamot dressing with subtle acidity and nice bitters in the aftertaste; the bitterness matched the sweetness from the gingerbread beautifully. Fantastic freshness from both the mint and the fragrant bergamot. The endive leaves had a great texture, nice and crunchy without any raw flavours. At the bottom of the bowl were some chopped grapefruit segments. A very original and creative take on the classic French endive & pain d'epice flavour combination with a great and original choice of ingredients. Second course, Mash & Gravy. Excellent smooth and creamy potato mash with a profound potato flavour - not too buttery. 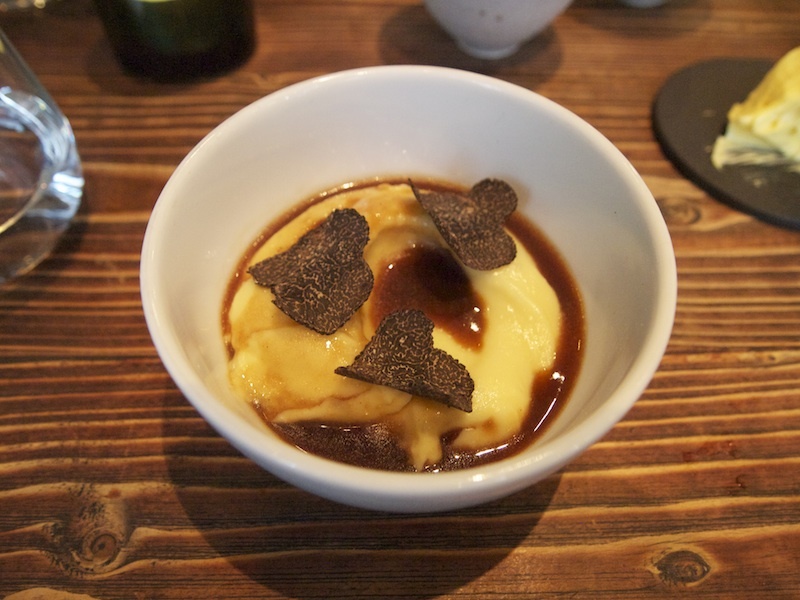 The mash was served with a gorgeous, well-reduced, rich turkey gravy and some shaved winter truffle. A relatively simple but very well-executed dish with perfect seasoning, the truffle adding a nice earthy touch. My third course was Braised cuttlefish, white beans, radishes and samphire. Very flavoursome, firm white beans and tender cuttlefish served with an elegant and comforting chickpea broth. Nice crunch and touch of pepperiness from the radishes. 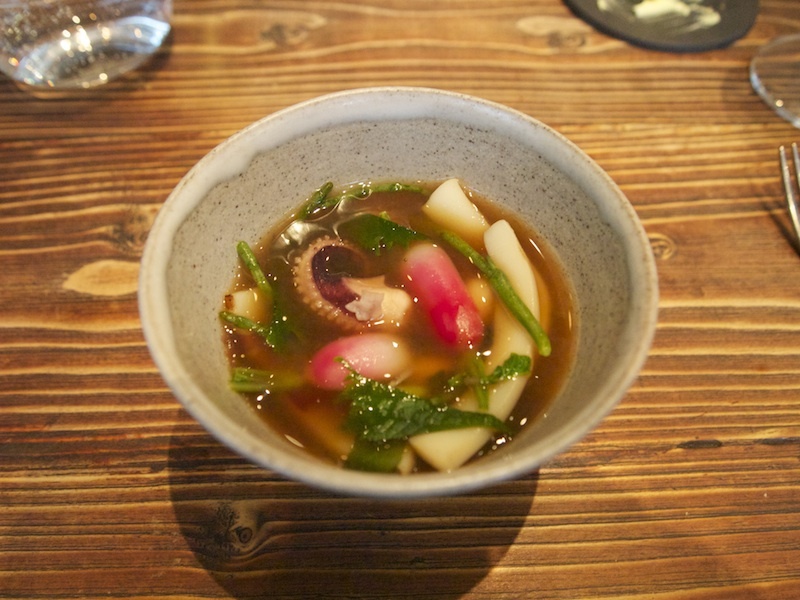 There was also some seaweed in the broth which added a nice depth of flavour. A lovely dish that was high in umami and had great textures too. On to the fourth course, Roasted skate, mustard, molasses, dill pickle. The skate, brushed with squid ink, was beautifully cooked but slightly overseasoned. The skate came with a light mustard cream made with yoghurt, mustard and molasses. Everything on the plate was flavoursome but for me it wasn't necessarily a very harmonious dish; the flavours did work but only just. The dill pickle and mustard cream did not manage to balance out the richness of the skate. Next, the fifth course: Rare grain-fed beef, Avruga caviar, warm horseradish buttermilk. Top-quality tender and creamy beef served with an absolutely brilliant, creamy buttermilk sauce sharpened with a hint of horseradish. The brilliance doesn't stop there however. Also on the plate were some chopped capers, wonderfully sweet onion rings, soft but still with a bite, a few tarragon leaves, Avruga caviar and some rye crumbs. A fantastic combination of flavours, comforting but challenging your palate with every mouthful. The rye provided a lovely touch of warmth and the caviar with its natural salinity blended beautifully with all the other flavours and ingredients. Finally the wonderful crunchy and peppery water cress, delivering texture and contrast. 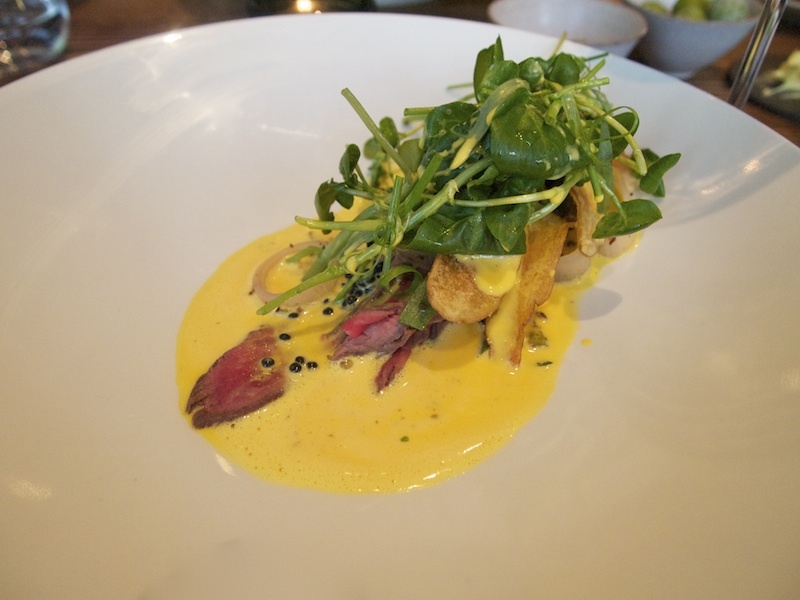 A spectacular dish that shows an exceptional level of creativity and understanding of flavour. Time for the dessert. 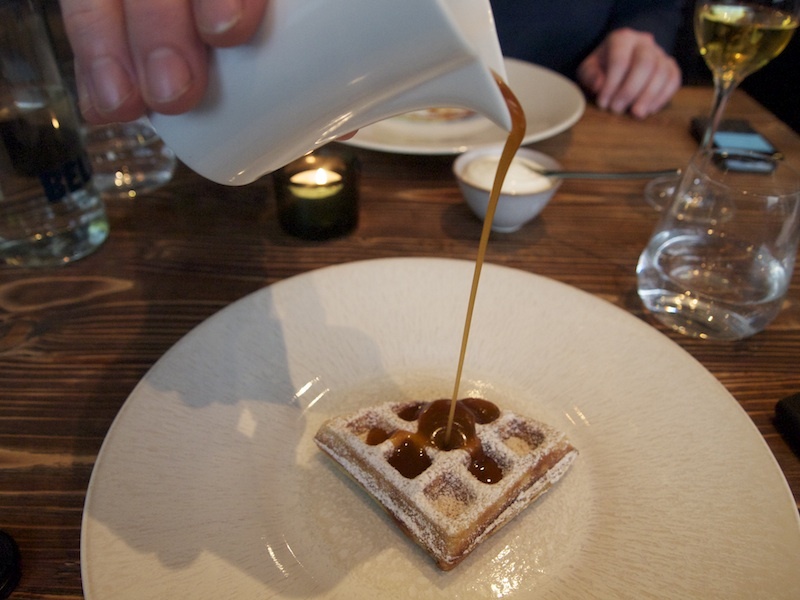 Warm buckwheat waffle, smoked fudge sauce & sour cream. Well-made warm buckwheat waffle, the buckwheat giving the waffle a lovely toasty and nutty finish. Gorgeous and highly addictive smoked fudge sauce, lovely well-judged smokiness, not overpowering in any way and it combined wonderfully with the buckwheat waffle. A rich and seductive dessert with the sour cream as the perfect accompaniment.